More than 150 job seekers attended last November’s job fair in Coatesville. The February 27th Coatesville Job and Career Fair will include more than 25 employers who are seeking to match their employment needs with potential employee skills. COATESVILLE — More than 25 employers are scheduled to participate in the latest Coatesville Job and Career Fair. The free event will take place Wednesday, February 27, 2019 from 4:30 p.m. until 6:30 p.m. at the CCIU – Gordon Early Literacy Center, 351 Kersey Street, Coatesville. The Job and Career Fair is open to the public, and candidates of all ages, experience levels and industries are encouraged to attend. All job seekers over the age of 18 who are looking for work or a better paying job are welcome, but should be professionally dressed and come prepared with resumes. 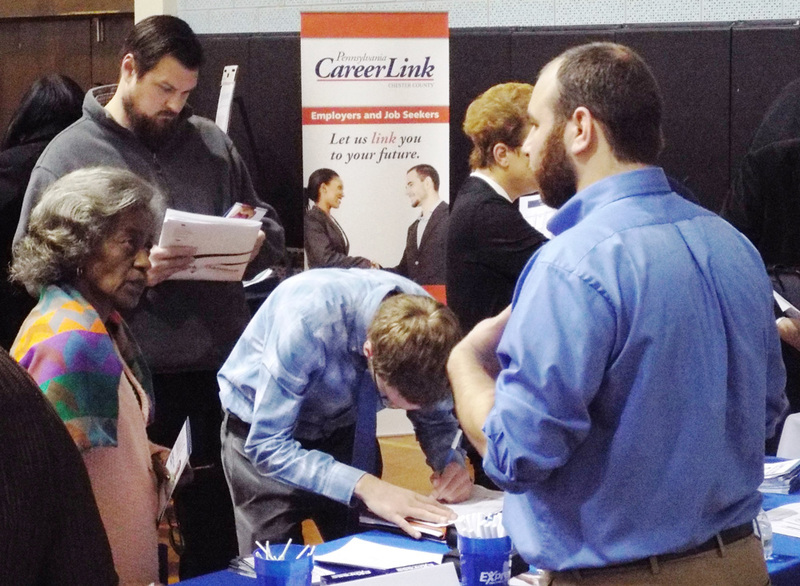 “The last job fair we held in Coatesville, in November, was a tremendous success,” said Pat Bokovitz, Director of the Chester County Department of Community Development and the County’s Workforce Development Board. “More than 150 people attended that event and the employers who took part were very pleased with the turn out. “With the many employment opportunities around the county, it is critical to have regular events like this one where employers can meet with job seekers to match employer needs with potential employee skills,” added Bokovitz. Employers participating in the February 27th Job and Career Fair include Randstad Staffing, Genesis Healthcare PowerBack Rehabilitation, Westlake Plastics, CCRES, Devereux, CF Fresh Co., the County of Chester, Monarch Staffing, Rover Community Transportation and Krapf Transportation, Warwick Child Care Center, ReMed, PathStone Corporation, PA CareerLink/United Way Financial Stability Center, Devereux Advanced Behavioral Health, Alternatives in Community Treatment, Interim Healthcare, South Mill Mushrooms, and Community Integrated Services. The event is made possible through the combined efforts of CCIU-Gordon Early Literacy Center, the Chester County Workforce Development Board and PA CareerLink® – Chester County. For further information about the job fair go to www.pacareerlinkchesco.org or call 610-280-1010.